Known in-house as the Valhalla, Tensile 1 as it was renamed by Stephen Lakin, chairman of Gearhouse Group PLC who funded the development, is currently the largest tented structure in the world available for hire. Rudi Enos designed the Valhalla as the largest of his 1990's portable membrane structures. Named after the Norse fables, hall of the gods, it was intended to be the largest portable structure ever built that is available for hire. It remains so today. Tensile 1 is simply staggering. This structure uses unique methods of design, manufacture and installation to achieve the project aims of providing the first large scale portable structure to house the same events as a permanent arena. 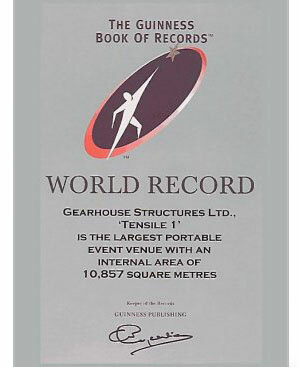 In 1998 the structure was award a Guinness World Record as the 'Largest Portable Event Venue'. The structure was originally used at Kempton Park in London, was used for the Gatecrasher Millennium dance event with 26,000 people, and housed the exhibition for the Earth Summit in Johannesburg in 2004. The Mighty Men Conference housed 35,000 men at one time in 2008. Today, the structure remains the largest portable structure available for hire for event use in the world. For more information on this amazing structure click here.